EL PASO, Texas (Reuters) - Beto O'Rourke, the former Democratic congressman considering a White House run, and President Donald Trump will hold dueling rallies in El Paso, Texas, on Monday over the U.S.-Mexico border and the president's push for a wall. 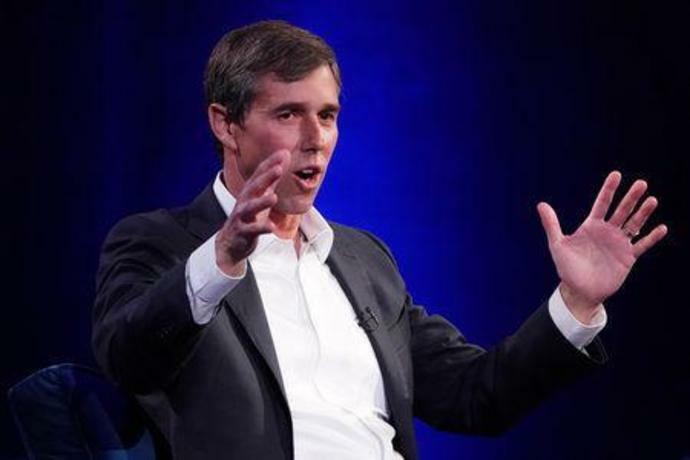 O'Rourke, who lost in his bid for a U.S. Senate seat in Texas, promised to blast Trump for stoking "false fear" about immigrants and telling "lies" about his hometown El Paso, which Trump said was a dangerous place before it had a border fence. In a conference call with reporters, O'Rourke said his counter-rally two hundred yards from the Trump event would be a "powerful, beautiful" response to "Trump's lies about our community, the U.S.-Mexico border, immigrants, about Mexicans." Trump is traveling to El Paso to argue for a wall he says can protect Americans from violent criminals, drugs and a "tremendous onslaught" of migrant caravans. "We're up against people who want to allow criminals into our society," he said of the Democrats. EL PASO: "LOW ON CRIME"
In his State of the Union speech last week, Trump said the border fence separating El Paso from Mexico had reduced the city's high crime rate. O'Rourke will join a protest march past Trump's rally at El Paso County Coliseum before they both speak within sight of the border fence. He declined to discuss a potential run on Monday. "I'm following the community's lead tonight, no less, no more," he said on the call. O'Rourke would bring fundraising and grassroots firepower to an already crowded Democratic field hoping to take on Trump in next year's election. All six people aboard a small plane died Monday after it crashed into the rocky hills of a central Texas ranch, authorities said.